When Hunter Currey first realized his desire to teach, his focus was on teaching high schoolers about "To Kill a Mockingbird." More recently he's found, however, that he's just as passionate teaching 7-year-olds to spell words like "bird." "I really enjoyed my high school English classes," Currey said. "But younger kids seem to be a better fit. They are easily pleased and excited about things we're learning in class." Currey received his bachelor's degree in liberal studies from Evergreen State College in Olympia, Wash., and his master's degree in teaching from Portland State University. Originally from northern Idaho, Currey has taught for 15 years. He started with a position through Teach for America in San Jose, Calif., and later moved to Oregon. He's now been in the Oregon Trail School District for three years, starting at Firwood Elementary in Sandy before coming to Naas Elementary this year. Currey noted that his move to the Oregon Trail district was very deliberate. "I just get the feeling that kids are really at the center, and they're really looking out for kids," he explained. "(The district has) high standards for success, (and) there's a really good community feeling." 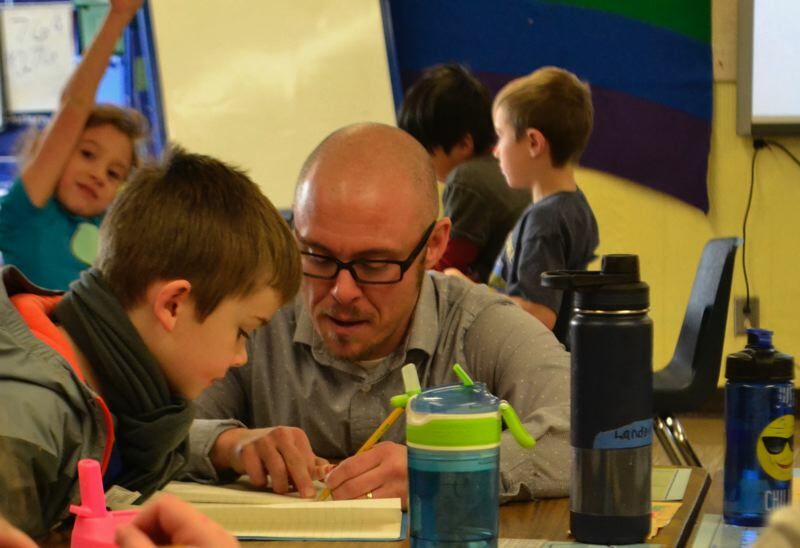 Compounding his appreciation of the district's overall methodology, Currey said what he finds most rewarding about teaching first grade is "seeing the kids work hard and find(ing) success." "I love to get to celebrate that success with them," he added. When he's not problem solving or grading spelling tests, Currey likes to ditch the indoors and go hiking. He and his family also spend a great deal of time outside together, and they're working on making their yard Backyard Habitat Certified. The biggest barrier Currey finds keeping students from being more successful involves socioeconomic issues, which affect students at home and at school. "Schools today are being asked to solve many of society's ills that we are not equipped to solve," he said. "Children are coming in needing more, and all of these basic needs have to be met before they're going to be able to learn."